Chennai: The ever lead actor of Kollywood and Superstar of Tamil Film Industry, Rajinikanth’s second daughter will get the divorce. Soundarya married the business person Ashwin in 2010; the married life will end soon. 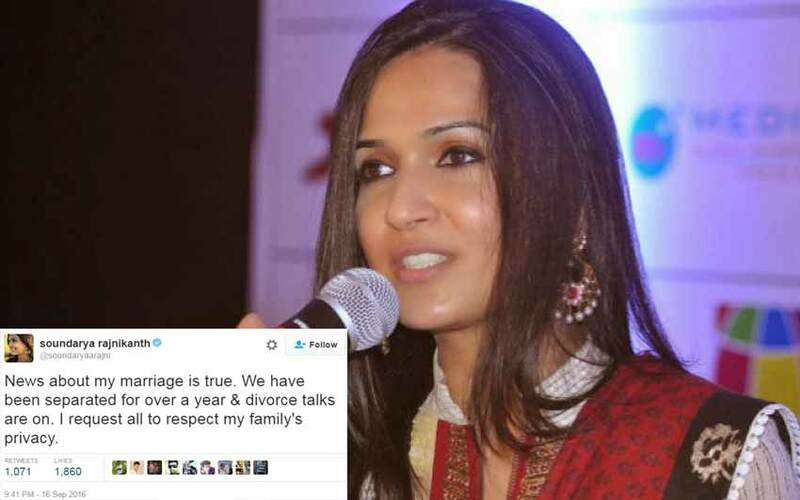 The Soundarya’s Official tweet confirmed it. She appointed as a brand Ambassador of AWBI. Some surroundings spread the rumor about Soundarya Divorce but at the end, she tweeted about that as true. Even though, the talk about her divorce is the hot news of the Kollywood. She accepted as the ambassador of Animal Welfare Board of India. So, all the celebrities were greeting him on twitter. In between her “Than You” replies, she confirmed about her divorce. Early, she worked along with his father on “Baba.” She is the professional graphical designers. So, her father allowed to direct him. She also worked along with the Sankar’s directorial blockbuster hit movie “Shivaji” in 2007. Here, it is greeting replies of Ms. Soundarya Rajinikanth about her AWBI ambassador to friends and celebrities. Peta India, Dhananjayan Govind, Her sister, Aishwarya R. Dhanush, Anirudh Ravichandran, Hrishikesh, Sreedhar Pillai, Sriya Reddy, Radikaa Sarathkumar, and Dhanush. So, the Ashwin Ramkumar-Soundarya Divorce talk is initiated now in their family as per the official report. Also, she mentioned that to respect their family personals and they need privacy.